Sleek, anatomically profiled and constructed with full-grain leather for unsurpassed comfort, the Gran Torino Boot is ideally suited to long days in the saddle; the perfect all weather riding / touring boot. The Alpinestars Gran Torino's proven weather protection is provided by an integrated Gore-Tex® liner, while advanced protection features are discreetly integrated in the chassis affording both safety and subtlety. Upper constructed from premium full-grain leather, offering greater comfort, durability and abrasion resistance. Integrated waterproof and breathable GORE-TEX® liner for proven all-weather performance. Black anodized aluminium protector on the outer ankle. Innovative, easy access side entry system with elastic mounted zipper and wide VELCRO® brand closures flap for a precise fit. Soft quilted accordion flex zone grants comfort whether riding or walking. For added convenience, the entire sole of the Gran Torino Gore-Tex Boot® is replaceable. The Gran Torino Gore-Tex® Boot is CE certified. These boots now have a hole in the bottom of them less then 14 months old and alpinestars refuse to repair or replace . Purchased about a year ago. 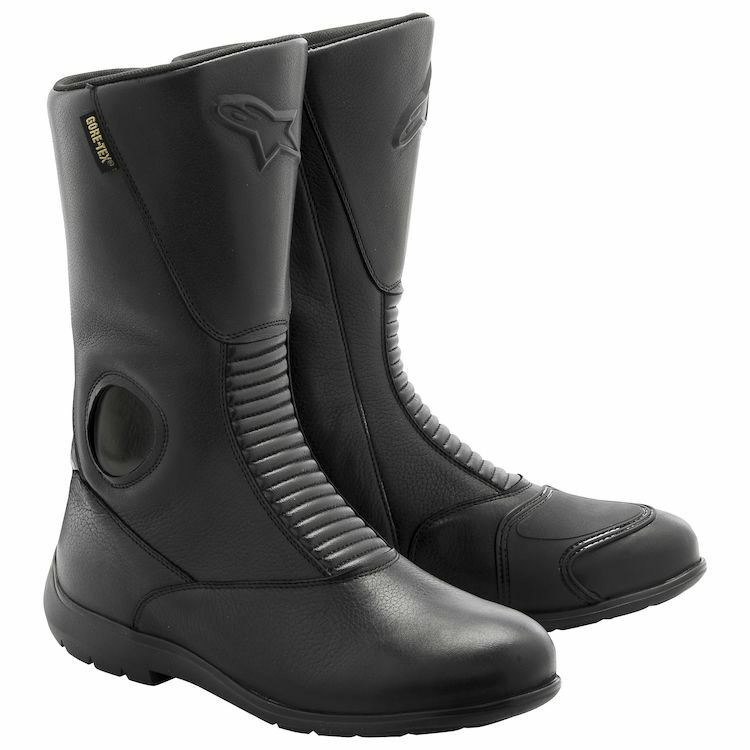 Wanted waterproof, durable, comfortable, safety-featured boot for long distance touring. This boot has all that. Break-in was brief. Excellent fit and comfort when riding or walking. I've worn these on two cross country trips, totaling about 17,000 miles. Completely waterproof, and comfortable in 100 F heat or 35 F cold. The Boots fit great right out of the box. I have been in the rain with them a couple times and they were waterproof. The Gore-tex liner makes them a little warm, but I knew that going in. They replaced a pair of Gore-tex TCX boots that leaked in the left toe box since new. Best riding boots ever. Comfort is great. Fit is right on. I've had these boots a couple years now. These boots are like slippers for me. I normally wear a size 10.5 in Nike, Asics, and most street shoes. On a foot measuring device I measure 10.5 and right on the boader line between a C and D width. I ended up with a size 43 in this boot. I'm a 44 in most MC boots. It was a little tight when I first put them on and I almost sent them back. Glad I didn't. The leather stretched out to a great fit after a few hours of riding. They are definitely water proof. They are full leather and waterproof which means they don't have any air flow. They are on the warm side and start to get hot for me when it's above 80 degrees. I gave them the excellent style rating because on several occasions women that I have never met before complemented me on the great looks of the boots. These were random encounters like sitting in a doctors office. I've got about 10k miles on these boots and they are still in good shape. With a few polishings they still look good. I'm sorry to see that they are being discontinued as I would buy them again. This is super comfortable good looking boot. It also is waterproof, (main reason I bought them) Leather is super soft and quality of boot is excellent. Only negative is the front top area is a little thin and your foot can feel the shifter more than I like. Nice waterproof boots good enough for all day comfort. These are very nice boots. They fit true to size but I think they are wide on my feet. They look very cool in real leather. They are not big and bulky or tall. I've worn them twice to work. They're comfortable all day long. I have not tried them out in the rain yet so I can't comment on waterproof but they are gore-tex so they should keep my feet dry. Minimal airflow by design. I 'm keeping them. Before ordering these, I'd ordered and returned a pair of Cortech boots. The pictures looked good and the price was right. However, after three rides to work and back, they were literally falling apart. I decided to spend a bit more and, based on reviews, thought these looked like a good choice. So far, it looks like I was right. They offer a larger fit. The Cortechs were a 49, and so are these, but while the Cortechs were tight, these feel just right. The Cortechs were stiff and would have required break-in had they stayed together, but the Alpinestars were immediately comfortable. The one thing I don't like is that they're pretty roomy around the calf, with no way to adjust that. I'd like to be able to adjust them for a closer fit, but it's not a huge issue. I keep trying to find bargain 'stuff' for me and my bike, but once again, I'm reminded that usually, a little more spent on a 'premium' brand is wholly worthwhile. I've been searching for a pair of street boots for a while now, and happened on this pair being on sale. Bit the bullet and am happy I did! Super comfortable right out of the box; I estimate the width to be a D (I normally wear a 2E) but not overly narrow. Revzilla's gear geek recommended I get the 43 as I normally wear an 8.5. There is enough room at the toe, I most likely have been safe getting a 42, but the 43 will give me room for winter socks. Another nice feature is the toe box is NOT bulky, fits comfortably under my gear shift.